This page provides release information about the SDK packages available for download from the SDK Manager, in the SDK Platforms tab. The Android SDK Platform package. This is required to compile your app for that version. Several System Image packages. At least one of these is required to run that version on the Android Emulator. Each platform version includes a system image for each supported form factor (handsets, Android TV, and Android Wear). Each form factor may offer variations to match your computer's processor architecture (such as Intel x86 and ARM EABI). System images labeled Google APIs include access to Google Play services and those labeled Google Play also include Google Play Store. The Sources for Android package. This includes the source files for the platform. Android Studio may show lines of code from these files while you debug your app. The revision numbers listed below are for the Android SDK Platform package only. The system images may receive separate updates, usually to resolve bugs with the emulator. There are no release notes for the system images, but you should always keep them up to date. 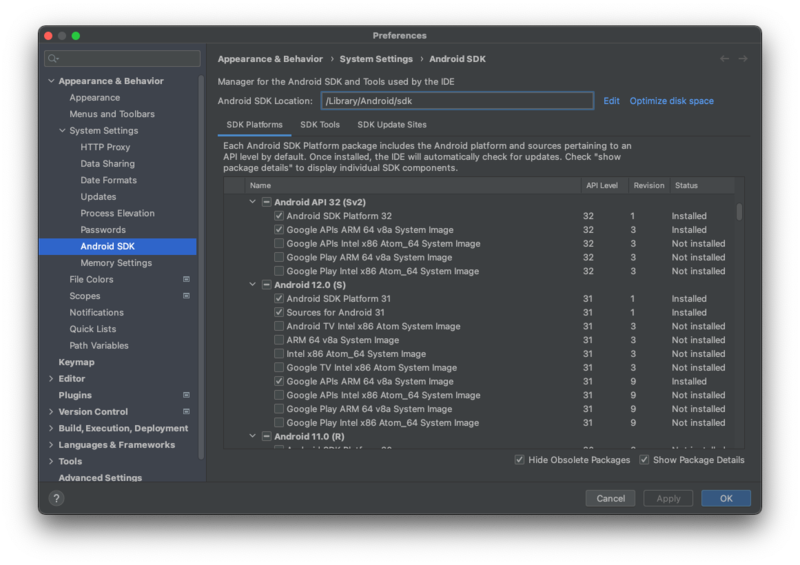 Important: To see the most recent Android system components in the Android SDK Manager, you must first update SDK Tools to the most recent release and restart the SDK Manager. For details about the platform changes, see Android 9 for developers. Released to stable channel (no longer in preview). For details about the platform changes, see Android 8.1 for developers. For details about the platform changes, see Android 8.0 for developers. For details about the platform changes, see Android 7.1 for developers. Incremental update. Released as the final Android 7.1.1 (no longer in preview). Android SDK Platform-Tools 25.0.1 or higher is required. Android SDK Build-Tools 25.0.1 or higher is required. Incremental update. Released as Android 7.1.1 Developer Preview 2. For more information, see the Android 7.1 API Overview. Initial release for Android 7.1 (API level 25). Released as Android 7.1 Developer Preview 1. For more information, see the Android 7.1 API Overview. Android SDK Platform-Tools 25.0.0 or higher is required. Android SDK Build-Tools 25.0.0 or higher is required. For details about the platform changes, see Android 7.0 for developers. Initial release for Android 7.0 (API level 24). For more information, see the Android 7.0 API Overview. Android SDK Platform-tools r24 or higher is required. Android SDK Tools 24.0.0 or higher is required. For details about the platform changes, see the Android 6.0 changes and Android 6.0 APIs. Fixed bugs in the layout rendering library used by Android Studio. Android SDK Platform-tools r23 or higher is required. Android SDK Tools 24.3.4 or higher is required. Initial release for Android 6.0 (API level 23). For more information, see the Android 6.0 API Overview. For details about the platform changes, see the Lollipop overview and Android 5.1 API changes. Initial release for Android 5.1 (API level 22). For more information, see the Android 5.1 API Overview. Android SDK Platform-tools r22 or higher is required. Android SDK Tools 23.0.5 or higher is required. For details about the platform changes, see the Lollipop overview and Android 5.0 API changes. Updated layouts in the Support Library and fixed various issues. Android SDK Platform-tools r21 or higher is required. Initial release for Android 5.0 (API level 21). For more information, see the Android 5.0 API Overview. This version makes KitKat available for Android Wear. Android SDK Platform-tools r20 or higher is required. Android SDK Tools 23.0 or higher is required. Initial release for Android Wear. For details about the platform changes, see the KitKat overview and Android 4.4 API changes. Maintenance release. The system version is 4.4.2. For more information, see the Android 4.4 API Overview. Android SDK Platform-tools r19 or higher is required. Android SDK Tools 22.3 or higher is recommended. Initial release. The system version is 4.4. For more information, see the Android 4.4 API Overview. For details about the platform changes, see the Jelly Bean overview and Android 4.3 API changes. Maintenance update. The system version is 4.3. Android SDK Platform-tools r18 or higher is required. Android SDK Tools 22.0.4 or higher is recommended. Initial release. The system version is 4.3. For details about the platform changes, see the Jelly Bean overview and Android 4.2 API changes. Maintenance update. The system version is 4.2.2. SDK Tools r21 or higher is required. Initial release. The system version is 4.2. SDK Tools r20 or higher is required. For details about the platform changes, see the Jelly Bean overview and Android 4.1 API changes. Maintenance update. The system version is 4.1.2. Maintenance update. The system version is 4.1.1. Initial release. The system version is 4.1.0. Maintenance update. The system version is 4.0.4. SDK Tools r17 or higher is required. Maintenance update. The system version is 4.0.3. SDK Tools r14 or higher is required. Initial release. The system version is 4.0.3. Maintenance update. The system version is 4.0.2. Initial release. The system version is 4.0.1. Initial release. SDK Tools r12 or higher is recommended. Requires SDK Tools r12 or higher. Improvements to the platform's rendering library to support the visual layout editor in the ADT Eclipse plugin. This revision allows for more drawing features in ADT and fixes several bugs in the previous rendering library. It also unlocks several editor features that were added in ADT 12. Requires SDK Tools r11 or higher. Fixes an issue with the visual layout editor rendering library that prevented Android 3.1 from running in ADT. Requires SDK Tools r10 or higher. Requires SDK Tools r9 or higher. Requires SDK Tools r8 or higher.